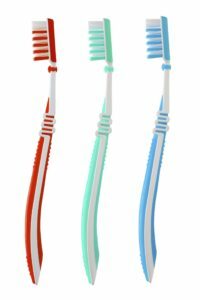 You, hopefully, use it at least twice a day, but when was the last time you gave any serious thought about your toothbrush? An effective toothbrush is essential for practicing quality oral hygiene, which not only brightens up your pearly whites, but also helps to prevent the build up of bacteria and the development of inflammation – both of which studies have linked to a range of serious long-term health problems, including dementia and heart disease. To help you pick the right toothbrush for the job of keeping your teeth and gums healthy and strong, keep these features in mind when buying your next brush. Should you buy an electric toothbrush that features a circular, rotating head or go with a more traditional manual brush with a rectangular head? While many dentist believe they’re both effective if you’re using the proper technique, an independent review by the nonprofit Cochrane Collaboration found that over a three-month period, circular, rotating heads – which are similar to the types of brush heads used during dental cleanings – removed 11 percent plaque than manual brushes. If you decide to stick with a manual brush, patients with narrow jaws – ask Dr. Beck – should consider using a brush with a tapered head. Unfortunately, no one-size-fits-all toothbrush exists. While you might think that a bigger brush is better, keep in mind that larger brush heads can still miss pockets of plaque found in tight spots between your teeth and hard-to-reach places towards the back of the mouth. You’ll know the right brush head when you find one that can comfortably clean all around the mouth. You should choose a brush with soft or extra soft bristles. A common misconception is that hard, tough bristles work better for removing plaque from tooth surface. However, because hard bristles don’t easily bend, they can miss areas between teeth and under the gums that need the most frequent cleaning. Hard bristles can also irritate delicate gum tissue. A 2011 study published in the Journal of Periodontology found that individuals who brushed with stiffer bristles had an 11 percent increase in bleeding gum after eight weeks. Unless you think they’re easier to hold, brushes that feature ergonomically designed padded grips have no effect on how well you brush. Just worry about finding a brush handle that doesn’t feel awkward in your hand when griped. If your toothbrush or electronic brush head has been helping you win the war on plaque for longer than four months, it’s time to send the brush into retirement. If you didn’t realize that toothbrushes needed changing that frequently, you’re not alone. Over 40 percent of Americans don’t know how frequently they need to change their toothbrush, according to a study conducted by the American Dental Association. Many individuals surveyed claimed that had used the same toothbrush for over a year. Unfortunately, during that time, worn out bristles become less effective at cleaning your teeth, thereby placing your oral health in jeopardy. Make the switch more often, and you can help ensure that you get the most out of your time brushing.